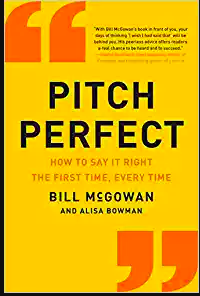 In preparation for some upcoming presentations I am due to give during the remainder of the year, I picked up Pitch Perfect: How to Say it Right the First Time, Every Time written by Bill McGowan. I had actually thought the book would be about making actual pitches and I wasn’t pleasantly surprised to discover that it was really the most detailed guide on public speaking – of every sort – that I had ever read. The author walks the reader through a detailed and personal story on why having the right response to a reporter is so important. Not to spoil it for you, but the end of the anecdote does include a punch to the face. He also shares an embarrassing story on how he began his career consulting for tech companies where he needed to take his own advice and communicate perfectly. Additionally, throughout the book there are illustrative examples from current events as to how important it is to say the right thing when put on the spot. The book covers every possible scenario of public speaking from presenting on a stage to a TV interview to how to speak at a dinner table. The author goes into precise detail on how one should dress for a TV interview and even where they should place their hands when presenting on stage. Whether you are a frequent public speaker, a team manager or just someone who likes to host dinner gatherings, this is a must read book. It would be impossible to come away from reading Pitch Perfect without learning dozens of new tips for how to communicate in the world. The book even ends with specific advice for how to give a wedding toast, a eulogy and congratulate someone for something you aren’t really happy about. Pitch Perfect is an absolute must-read book!